Worked with an extremely helpful PayPal service rep to get a workaround for the currently issues they're having, so I'll begin on the sorting and conversion process today and invoice should start being sent tomorrow since I have to go to my brothers' performance tonight. Welcome to the long awaited GB for the budget96, the budget-friendly 96key kit. This GB is intended to run from 4/30 to 5/27 with an estimated delivery date in June. Edit: Adding in shipping information since I missed it before like a dummy. For shipping CONUS It'll be roughly $15 from me(east coast) to California via Priority with some insurance, meaning everywhere inbetween should be cheaper incrementally. For Canada, it looks like about $17 First Class Intl uninsured. For other intl countries it should be approximately $25 First Class Intl. If I see enough numbers to make a proxy price efficient then I'll hook up with them, but there has to be numbers shown in the order form to do that, so please order to show interest. I think I've covered everything here, but be sure to let me know if you think anything is missing! Re: [GB] budget96 Now Live! as a 96key user, i love this project. I will try and convince some co-workers to jump on this. Nice job! Looks like you managed to get it in at 105 bucks with everything except the hipro plate. This will probably end up being the first board I attempt to build. 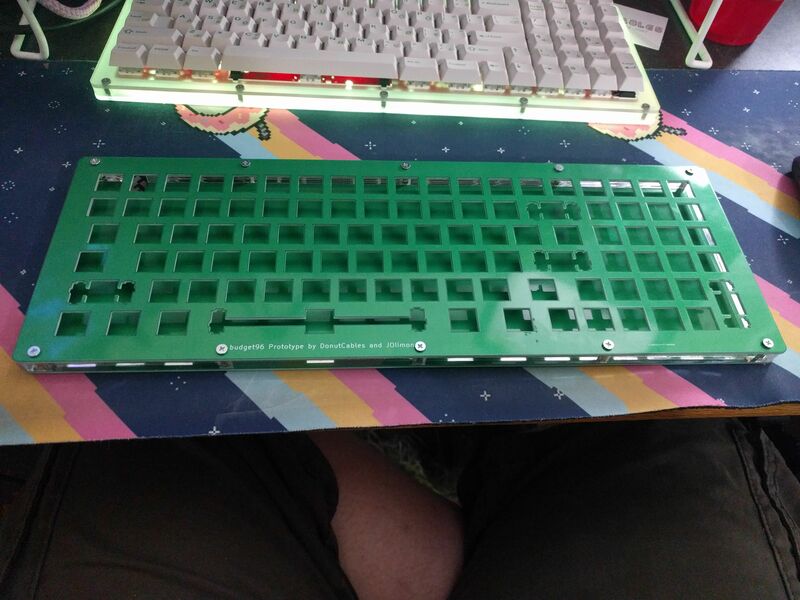 I am just wondering if it might be possible to get just the plates and pcb (and assembly hardware/screws) without the middle acrylic? I like the look of it, but for like 40 bux on a board that is already budget minded, I would probably go w/o it and get an extra pcb if possible and just use an open middle with the standoffs in between the plates. Will you be posting updates to let us know where we stand in terms of MOQ throughout the GB? Or will we not know until the end? Welcome to the first update for the budget96! There's a lot of stuff to go over, so I'm gonna try a couple ways to do this before I settle. PCBs - Doing better than I expected for the first day, we're at almost 1/3 for purple, over 1/3 for black, so they're looking well on the way to MOQ and beyond. Plates - Both the default colors have hit the lowest MOQ, so there's only price drops from here on out for them! I must say I did expect the blue plates to make an appearance, but I didn't actually expect the green ones to show up, so we'll see how far they go. Acrylic layers - Middles have easily surpassed the lowest MOQ and are toeing the line of the next price drop. Hipro are actually more popular than I expected and I forsee them easily hitting lowest MOQ and getting along nicely. GMK Stabs - 1 set of stabs per order placed, on average, not bad indeed. These should have no issue hitting MOQ. We've had lots of progress in the first day, so hopefully we can keep this up! I'm hoping this breakdown was easy to understand and I'll be looking to update at least every few days if not sooner. Don't be afraid to ask any questions you may have! Does the most barebones kit possible require only PCB, case, and plate? The middle piece and hipro are cosmetic add-ons basically. Is that correct? EDIT: I looked at the order-form, and it sounds as if the middle is required and includes all the screws and such. Still a little confused though; I'm not familiar with sandwich cases. The plates and acrylic middle make up the case. 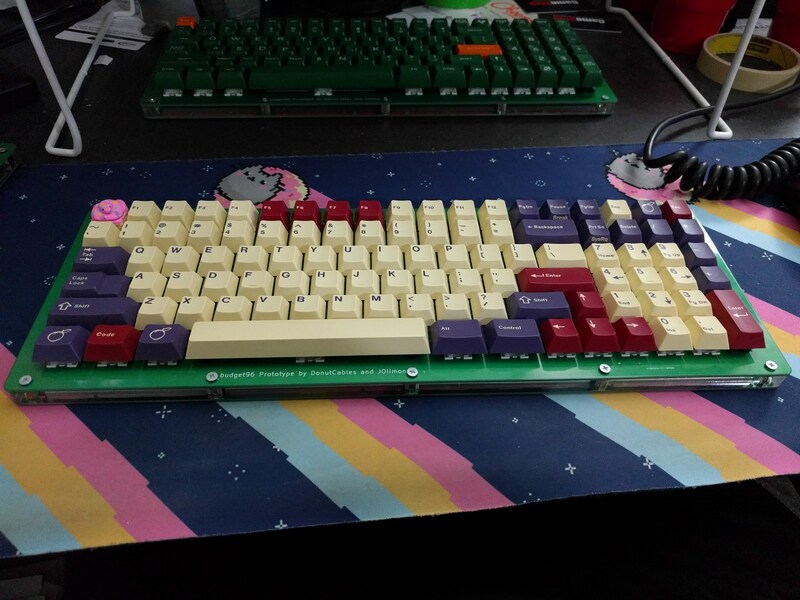 cant wait to get my hands on that purp PCB! Just placed an order for two full sets! Depending on what MOQs are hit....may grab another. Ooooh, I get it. Thanks. For some reason, I read case, plate, and middle as separate pieces instead of the latter two's being a subset of the former. Figured I'd post today's updated a little early since I'll be spending the evening working on OG Coil invoicing. Pasted from my comment on Reddit, so let me know if the formatting messes up part of it. White - 10/25, 10 MOQ hit! Black - 16/25, 10 MOQ hit! Middles - 33/60, 15 MOQ and 30 unit price drop hit! Middles are now down to the $33 price point! Good numbers so far and I look forward to seeing what we can reach throughout the rest of the month. Do you need a mid or hipro layer to complete the kit? Or will just the plate be sufficient? Also is the top keyboard here an example of the "white" case? Ie) somewhat transparent with the underglow? I don't think this has been asked at any point: Will the production plates have anything written on them like all the ones pictured do ("Prototype by...")? My understanding is that a mid layer is needed based on the hardware used to secure the plates. The case you reference in the picture is translucent acrylic and is not an example of the white case. The white pcb material is the same level opaqueness as the green but in gloss like white. The white is good at reflecting the rgb off the bottom plate and out the middle acrylic though. just wanted to be clear if we order this now we don't get a invoice tell the buy ends? Mid is required, hipro is not. The board in that picture is the all acrylic Rev1 prototype. There will be no silkscreen visible once the case is assembled. There will be some on the inside of the plates where it won't be visible in normal use since the manu forces a production number onto everything, and I may include some. Correct, invoicing will not happen until the GB period is over. 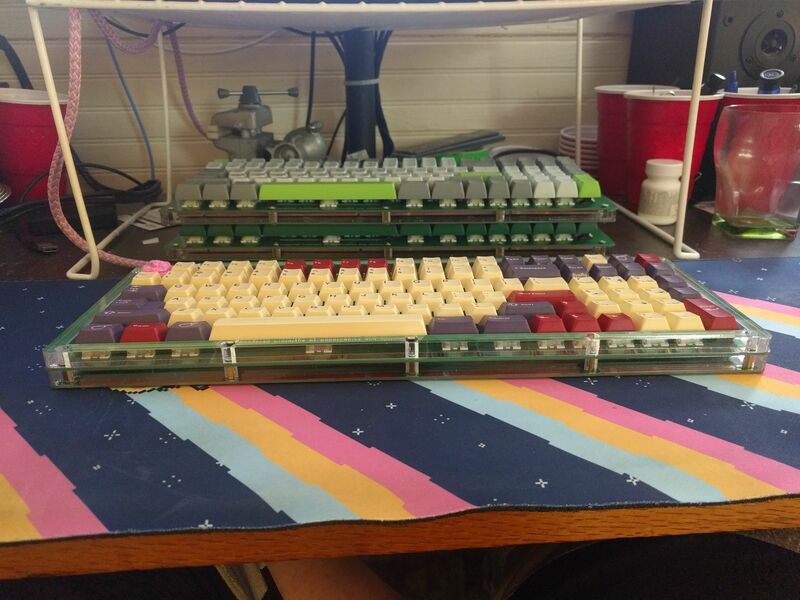 The PCB would work with the Espectro right? 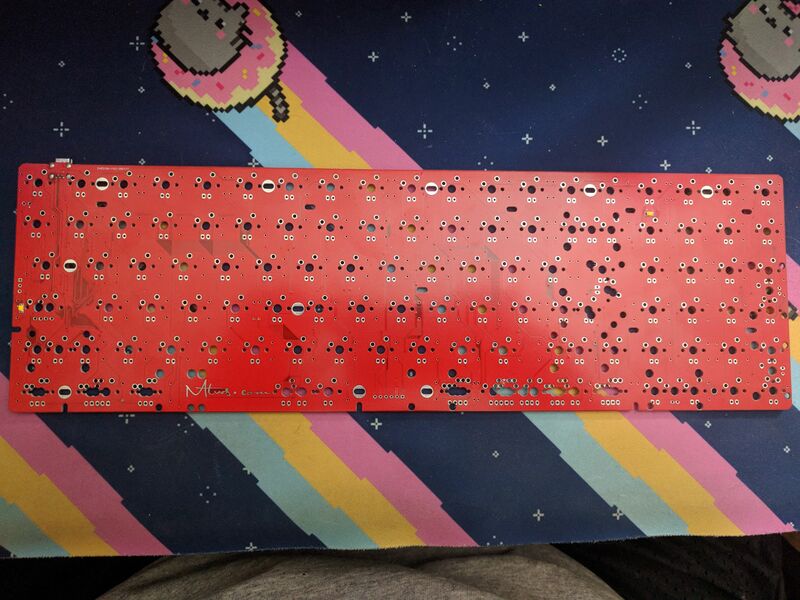 I would be able to just use the Espectro case+plate along with this PCB? It should work with any case that has the USB port between column 0 and column 1 on the left side. Can't be 100% certain though. Alright thanks, I'll check the espectro thread to confirm. Edit: Looks like it'll work. I'll be in for two PCB's, one of each. Edit 2: There isn't an option to not buy the plate? You choose a plate color and then just pick 0 on the case kit since the case kit includes the plates. Gotcha. Submitted for 1 purple and 1 matte black PCB. Alright, time for an update. The last one seemed to work well, so I'll try doing that again. White - 19/25, 10 MOQ hit! Black - 22/25, 10 MOQ hit! Middles - 47/60, 15 MOQ and 30 unit price drop hit! Hipro - 18/30, 15 MOQ hit! Looking really good for just overt a week at this point and we're well on track to hit all the MOQs we need and a good few price drops as well! Time for another update on numbers! White - 22/25, 10 MOQ hit! Black - 25/50, 10 MOQ hit, 25 unit price drop hit! Middles - 54/60, 15 MOQ and 30 unit price drop hit! Hipro - 19/30, 15 MOQ hit! Black plates are the first to hit the first price break with white not far behind, dropping base kit prices $5. Middles are 90% of the way to hitting their final price drop bringing the base kit price down another $3 when they do. White - 25/50, 10 MOQ hit, 25 unit price drop hit! Black - 28/50, 10 MOQ hit, 25 unit price drop hit! Middles - 62/60, 15 MOQ 30 unit and 60 unit price drops hit! Hipro - 23/30, 15 MOQ hit! Middles - $37 $33 $30! Continuing to do well, PCBs are doing very nicely and I expect them to hit MOQ without help. Middles are at their lowest price. Plate price drops will be the majority of price reductions from here on out. Is the moq for stabilizers 100? Or are you selling them regardless and 100 is a price drop? If it's moq, i can add a couple more to my order. That's MOQ, though if they get reasonably close without hitting I'm willing to buy to MOQ. Okay thanks. Either way, I think I ordered 2, can you bump that up to 4? Black - 30/50, 10 MOQ hit, 25 unit price drop hit! Middles - 66/60, 15 MOQ 30 unit and 60 unit price drops hit! Hipro - 24/30, 15 MOQ hit! We had a couple order drops this week, but I'm still happy where the numbers are going. loving these numbers! would love to see the white & black plates hit 50 (since I ordered one of each ). Dumb question; Should i have gotten any sort of confirmation for filling out the order form? I never saw anything in my email and was just worried i may have goofed on my order. Afaik no confirmations since I've got it set to not automatically pick up emails. Very interested in joining, pardon my ignorance, but to be clear hipro layers mean high profile? Will the writing be on the case (budget 96 etc.)? I actually kind of like it. No silkscreen will be visible on the outside, there will be some on the inside where it's not visible in use. Matte black - 50/100, 50 MOQ hit! Purple - 45/100, pushed to 50 MOQ! White - 29/50, 10 MOQ hit, 25 unit price drop hit! Black - 36/50, 10 MOQ hit, 25 unit price drop hit! Middles - 80/60, 15 MOQ 30 unit and 60 unit price drops hit! Hipro - 30/30, 15 MOQ hit, 30 unit price drop hit! GMK Stabs - 84/100, pushed to MOQ! Plates - $25/set, Black and White plates - $25 $20/set! Stabs - $13, at MOQ! Question... the moq for green plates is 7, assuming I am the only further buyer for green, giving 8 sets ordered and therefore 2 lower than MOQ, what happens? Green is the only colour i'm keen on so i'm not sure what happens if you order and the MOQ isn't met. New to group buys on GH, hence the question. On the order page you select a fallback plate color (white/black) in case the color you choose doesn't hit MOQ. In the form there's an option for choosing one of the default plate colors(black/white) in the event your first choice doesn't hit MOQ. In this particular case, 8 is close enough that I'm willing to push it to 10 MOQ. Matte black - 52/100, 50 MOQ hit! Purple - 46/100, pushed to 50 MOQ! White - 30/50, 10 MOQ hit, 25 unit price drop hit! Black - 38/50, 10 MOQ hit, 25 unit price drop hit! Green - 8/25, pushed to 10 MOQ! Middles - 83/60, 15 MOQ 30 unit and 60 unit price drops hit! GMK Stabs - 88/100, pushed to MOQ! Blue, Red, and Yellow plates are currently struggling. If there's anyone that really wants those to hit, please join. It'd be awesome to see those hit MOQ, but I just can't afford to push them when there's this few ordered. Matte black - 57/100, 50 MOQ hit! Purple - 50/100, 50 MOQ hit! White - 33/50, 10 MOQ hit, 25 unit price drop hit! Black - 41/50, 10 MOQ hit, 25 unit price drop hit! Green - 10/25, 10 MOQ hit! Middles - 91/60, 15 MOQ 30 unit and 60 unit price drops hit! Hipro - 33/60, 15 MOQ hit, 30 unit price drop hit! GMK Stabs - 98/100, pushed to MOQ! Orders still slowly making their way in. At this point most everything has hit base MOQ by itself. Blue is still right on the edge of being able to push it there, yellow and red are still behind and even though I want to see them made it's not viable at this low a number. If you really want to see them made as well now is the time to join! Entered, hyped! Any chance of a EU proxy for this, or is that out of the question with the origin of orders so far? Purple - 53/100, 50 MOQ hit! Matte black - 63/100, 50 MOQ hit! Black - 43/50, 10 MOQ hit, 25 unit price drop hit! White - 36/50, 10 MOQ hit, 25 unit price drop hit! Blue - 7/10, pushed to 10 MOQ! Green - 11/25, 10 MOQ hit! Middles - 99/60, 15 MOQ 30 unit and 60 unit price drops hit! Hipro - 36/60, 15 MOQ hit, 30 unit price drop hit! GMK Stabs - 107/100, pushed to MOQ! Most components have hit base MOQ, some have hit price breaks, and some haven't hit. Blue plates are close enough I'm willing to push them at this point, but more orders for them wouldn't hurt. Red and yellow currently aren't close to MOQ, and trying to push them at this point would detract too much from my ability to have backup materials on hand for the buy. For those three that ordered them, unless there's significant orders in the next 24hrs you'll be kicked to your backup choices. Other than that, expect invoicing to begin in the next couple days after I've had time to collect submission data and transfer it to invoicing. We're actually up to 10-11 EU orders right now, so that could definitely be an option. I'll have to check with my usual EU proxy buddy and see what the prices would be for bulk shipment to them and then their domestic shipping. Also, I would like to reiterate, please read the form and don't put your email in the physical shipping address box. Additionally, put the entire address that I ask for and not just the street address. I'm getting quite tired of the extra work this causes me as well as the extra time it adds to the GB fulfillment having to go and get this information when it should have been given in the form. Beginning in my next GB, whatever that may be, I'll begin more strictly enforcing this with order cancellations and possible blacklisting like I've begun enforcing with invoice dodgers. Page created in 0.13 seconds with 71 queries.